THE GAY DIVORCEE (1934) Oscar winner* The Continental revels in precision-dance joy, Cole Porter? ?Â€?s Night and Day sways with timeless grace and Fred and Ginger? ?Â€?s first top billing sets the tone for more film hits to come. SHALL WE DANCE (1937) A George and Ira Gershwin score has Fred tapping to Slap That Bass rhythms of a ship? ?Â€?s engine room and the duo? ?Â€?s Let? ?Â€?s Call the Whole Thing Off skate routine. Pure bliss! SWING TIME (1936) One of the team? ?Â€?s greatest! The Jerome Kern/Dorothy Fields score goes from jubilant (Pick Yourself Up, Bojangles of Harlem) to sublime (the Oscar-winning** The Way You Look Tonight, A Fine Romance). TOP HAT (1935) The pair? ?Â€?s best-remembered film features Fred? ?Â€?s signature Top Hat, White Tie and Tails, the incomparably romantic Cheek to Cheek and more in Irving Berlin? ?Â€?s tip-top score. DISC 1: SIDE A ~ THE GAY DIVORCEE INCLUDES: ??Â€? 2 Shorts ??Â€? Show Kids and Star Night at the Cocoanut Grove ??Â€? Cartoon Shake Your Powder Puff ??Â€? Audio-Only Bonus: Hollywood on the Air Radio Promo ??Â€? Theatrical Trailer SIDE B ~ SHALL WE DANCE INCLUDES: ??Â€? Commentary by Songwriter Hugh Martin and Pianist Kevin Cole ??Â€? Featurette The Music of Shall We Dance ??Â€? Musical Short Sheik to Sheik ??Â€? Cartoon Toy Town Hall DISC 2: SIDE A ~ SWING TIME INCLUDES: ??Â€? Commentary by John Mueller, Author of Astaire Dancing ??Â€? Featurette The Swing of Things: Swing Time Step by Step ??Â€? Musical Short Hotel a la Swing ??Â€? Cartoon Bingo Crosbyana ??Â€? Theatrical Trailer SIDE B ~ TOP HAT INCLUDES: ??Â€? Commentary by Fred Astaire? ?Â€?s Daughter Ava Astaire McKenzie and Film Historian Larry Billman ??Â€? Featurette On Top: Inside the Success of Top Hat ??Â€? Comedy Short Watch the Birdie with Bob Hope ??Â€? Cartoon Page Miss Glory ??Â€? Theatrical Trailer All 4 Movies ??Â€? Subtitles: English, Fran? ?ais & Espa? ?ol (Main Feature. Bonus Material/Trailer May Not Be Subtitled). 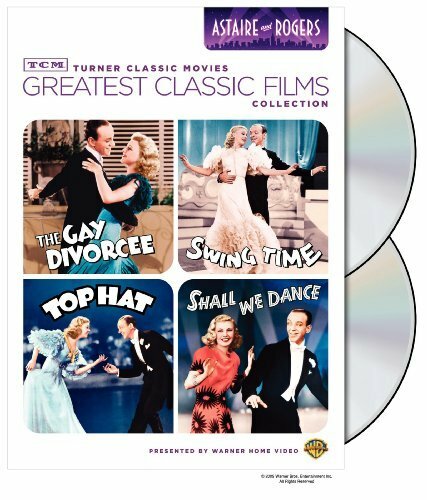 If you have any questions about this product by Turner Classic Movie, contact us by completing and submitting the form below. If you are looking for a specif part number, please include it with your message.